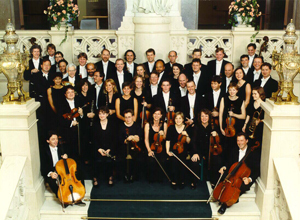 The Chamber Orchestra of Europe, hailed as one of the finest ensembles in the world, was founded in 1981, and draws its fifty members from fifteen countries. Since the initial inspired idea of its formation, the COE has flourished with the commitment and dedication of its players who all pursue parallel careers as soloists and chamber musicians of eminent ensembles. They come together for individual concerts, tours, festival engagements and recording projects, with a motivating energy stemming from the players' shared love of music-making at the highest level with likeminded musicians combining a wealth of cultural backgrounds. Performances are given regularly in the major cities of Europe and occasionally the USA, Hong Kong, Japan and Australia. The COE has strong links with the Deutsche Ensemble Akademie and Alte Oper in Frankfurt and the Styriarte Festival in Graz, as well as the Philharmonie in Cologne, the Cité de la Musique in Paris, and the Berlin, Bremen and Salzburg Festivals. Among the world's leading conductors and soloists with whom it performs, Claudio Abbado and Nikolaus Harnoncourt are especially important to the COE. The COE's list of recordings includes over 250 works, many produced by Sanctuary Classics, with which it was the first orchestra to have its own label - COE Records. It is Claudio Abbado with whom the Orchestra won the first two of its three Gramophone 'Record of the Year' awards - for Deutsche Grammophon's complete Schubert cycle, and for Rossini's Opera Il Viaggio a Reims; and Nikolaus Harnoncourt with whom it won its third - for Teldec's complete set of the Beethoven Symphonies. Paavo Berglund has also played a vital role in the Orchestra's life, and in addition to their recording together of a complete Sibelius symphony cycle, which has won the coveted Diapason d'Or, this Brahms symphonic cycle continues their close collaboration.